In response to increasing demand for electronic file distribution of publications and the associated lower purchase price, Quinte Branch has decided to make Portable Document File (PDF) distribution the standard for some publications. PDF files will be delivered to our customers by either email attachments or email links to download sites for large files. While traditional printed versions of these publications can still be ordered to suit customer needs, unit prices (not shown) for the print option are generally higher and are subject to Shipping & Handling charges. Printed pricing for PDF files available on request. From a little seed, a mighty branch grew and grew and grew and is still growing! 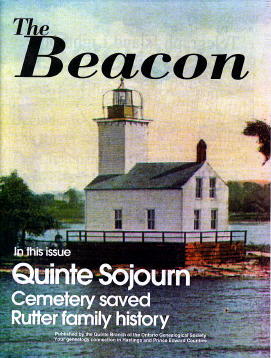 This booklet covers the humble beginnings of Quinte Branch in 1980 in Bloomfield, through our move to Ameliasburgh in 1994 as a tenant at the Marilyn Adams Genealogical Research Centre and continues with our latest sojourn to the Quinte West Public Library in 2006. The different sections lists the original 26 charter members, all officers throughout the 30 years and their time of service. Special projects and endeavours are written about: setting up the library, fundraising, the establishment of Cemsearch, our Finding Aid Index, our web site, cemetery recording project, etc. Have you heard of a "Bakeless Bakesale"? Our aim and purpose has always been to gather and preserve the stories of people; help each other; and share to the benefit of all. The first original atlas of Hastings County since Belden's Atlas of 1878. Colourful maps and photographs bring you the story of this beautiful sprawling county in Eastern Ontario. The perfect guide to one of Ontario’s oldest and largest counties. 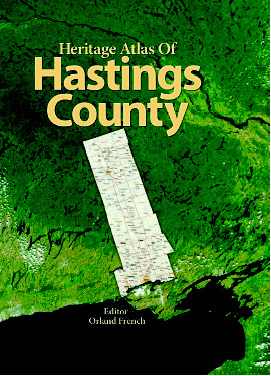 Maps, charts and colourful graphics trace the evolution and development of Hastings County over 200 years from the arrival of the first European explorers to today’s thriving and complex society.